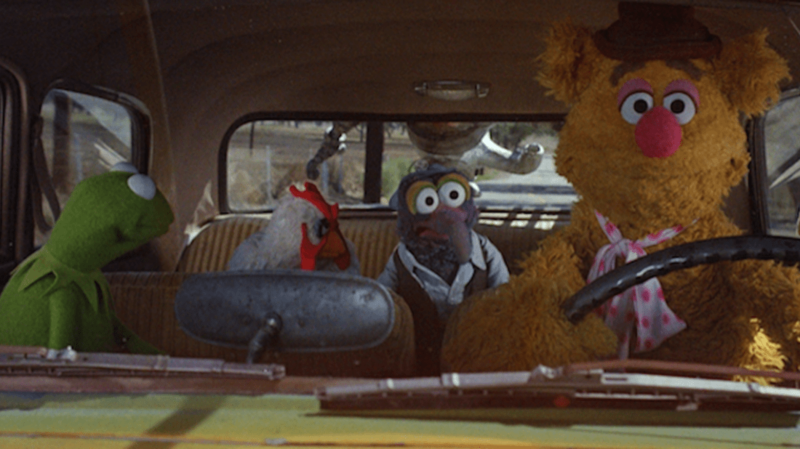 When The Muppets made their feature film debut in The Muppet Movie in 1979, the result was pure magic. The dreamy songs, innovative special effects, and bubbly characters all catapulted the flick to box office gold and widespread critical acclaim. (It also kicked off a beloved movie franchise that’s still chugging along today.) Here are some facts about how Jim Henson and director Jim Frawley made it all happen, and the famous faces you missed behind those puppets. 1. THE SET WAS SURPRISINGLY UNHAPPY. 2. “THE RAINBOW CONNECTION” REQUIRED A DIVING BELL. For the movie’s adored opening song, Henson had to find a way to operate Kermit while completely hiding himself in a swamp set. His solution was to fold himself into a custom-made diving bell placed in a water tank. And you should take the folding part quite literally. Because the tank was only four feet deep, the diving bell was correspondingly short; Henson, who was 6’3”, had to contort himself into the bell with his monitor. Then, he would stick his arm through a rubber tube to control Kermit. The whole scenario was so strange that it scared Henson’s 13-year-old son John when he visited the set. 3. FOUR PUPPETEERS AND A LITTLE PERSON DROVE THE STUDEBAKER. 4. THAT STUDEBAKER IS NOW IN THE STUDEBAKER NATIONAL MUSEUM. The 1951 Bullet Nose Studebaker Commander now belongs to the Studebaker National Museum in South Bend, Indiana. The museum opened in 2005, but South Bend has curated Studebakers for much longer than that. Since the cars were manufactured in the city, the Studebaker Corporation donated its entire collection and archives to South Bend in 1966 after its final car was assembled. That’s how the museum wound up with 120-plus cars in its collection, including the prized Commander. 5. ORSON WELLES’S CHARACTER IS NAMED FOR THE PRODUCER. Orson Welles appears briefly in the movie as producer Lew Lord, and that moniker was no accident. It was a nod to British producer Lew Grade, who got The Muppet Show on the air when all the American networks passed and executive produced The Muppet Movie. Also, he was an actual lord. 6. THE CREW HAD TO BUILD A 60-FOOT ANIMAL. When Animal accidentally eats Dr. Bunsen Honeydew’s Insta-Grow pills, he memorably balloons through the roof. Henson refused to use a normal puppet on a miniature set to accomplish this effect, so his crew had to construct a gigantic Animal head that measured 60 feet. 7. THE SHOOTING STAR WAS REALLY A CHRISTMAS TREE LIGHT. For the scene where Kermit has a desert revelation, Frawley wanted to include a shooting star in the night sky. So the crew attached a Christmas tree light to a wire on the sound stage and when they got the signal, shot it across the set. 8. DOC HOPPER WAS SUPPOSED TO EARN REDEMPTION. Frank Oz and Jim Henson had a pretty harmonious working relationship, but they did disagree on one part of The Muppet Movie: the fate of villain/ Colonel Sanders caricature Doc Hopper (played by Charles Durning). Henson believed they should redeem Hopper in the end, proving that he wasn’t such a bad guy after all. But Oz didn’t share that idealistic view. As Brian Jay Jones recounted in Jim Henson: The Biography, Oz dismissed this as “bullsh*t.” And clearly, he won. 9. JIM HENSON AND FRANK OZ APPEARED AS TWO OF HOPPER’S MEN. Henson and Oz voiced several Muppets in the movie, but they also played two of Doc Hopper’s nameless gunslingers in the western showdown scene. (They're simply billed as “Doc Hopper’s Men” in the credits.) See if you can spot them in the clip above. 10. THE FINALE FEATURED 250 PUPPETS. Henson had a vision for the musical finale of The Muppet Movie, and that vision involved 250 puppets. He wasn’t content to fill the screen with placeholders, either; Henson wanted every single puppet actively participating in the number. To accomplish this feat, the production had to hire almost 150 extra performers through the Los Angeles Guild of Puppeteers of America. On the day of filming, everyone took their marks on the floor of an enormous pit and when Frawley shouted, “Muppets up!,” each person raised their Muppet(s) for the ambitious final number. 11. THOSE PUPPETEERS INCLUDED JOHN LANDIS AND TIM BURTON. 12. THE MOVIE WAS DEDICATED TO HENSON’S HERO, EDGAR BERGEN. 13. “I’M GOING TO GO BACK THERE SOMEDAY” WAS SUNG AT HENSON’S MEMORIAL. After Henson passed away on May 16, 1990, his friends and family prepared a medley of his favorite Muppet songs for his memorial at St. John’s Cathedral in New York City. Gonzo’s poignant Muppet Movie ballad, “I’m Going to Go Back There Someday” was one of the selections, and Gonzo himself (or at least his voice actor, Dave Goelz) performed it.